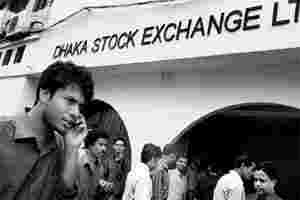 Promising market: People walk in front of the Dhaka Stock Exchange. The exchange’s index is at a 10-year high—up 66% this year, making it Asia’s top performer after China. Mumbai: In 1999, Yawer Sayeed returned to his native Bangladesh from Australia to set up a money-management company. After eight lean years his business is booming. A military-backed government in place since January has attracted investors by pledging to sell state enterprises and arresting about 150 former officials to fight corruption. The Dhaka Stock Exchange Index is at a 10-year high—up 66% this year, making it Asia’s top performer after China. “It’s been a long haul," said Sayeed, chief executive officer at Asset & Investment Management Services of Bangladesh Ltd, the country’s first and only private fund manager. “It’s a quantum leap in the mindset of the government and bureaucracy that they’re embracing privatization." He said he sees the same work ethic growing in Bangladesh that he saw on a 2005 trip to Vietnam, whose stock market has increased 40 times since the end of that year. The asset value of Sayeed’s first two funds has more than tripled to 1 billion taka (Rs58.5 crore) this year, and he is about to set up a third, hoping to tap demand for share offerings. Citigroup Inc., JPMorgan Chase & Co. and Merrill Lynch & Co. Inc. are betting Bangladesh may be the next Asian success story. “Bangladesh is increasingly on the radar of the international investment community," Mamun Rashid, Citigroup’s Bangladesh country officer, wrote on 19 September when he announced the bank’s expansion in the country. JPMorgan named Bangladesh one of the “Frontier Five" markets worth investigating in a 4 April note, along with Kazakhstan, Kenya, Nigeria and Vietnam. Adrian Mowat, the New York-based bank’s chief Asian and emerging market strategist, said growth in the country’s working-age population was faster than Vietnam’s. Vietnam, which Mowat called the “frontier market poster boy," sold more than 50 state-owned companies in the past year, three decades after South Vietnam fell to the Communist north. Its benchmark Ho Chi Minh City Stock Exchange VN Index has risen 44% in 2007 after more than doubling in 2006. The $20 billion market was worth just $500 million at the end of 2005. In Bangladesh, 26 non-financial, state-owned enterprises, including sugar plantations and textile mills, will be sold to private investors, according to Zulqar Nain, head of chancery at the Bangladesh embassy in Washington, DC. So will GrameenPhone Ltd., founded by Nobel Prize winner Muhammad Yunus. Bangladesh, whose 150 million people live on an average of $1.30 a day, may seem an unlikely market for international investors. Almost two-thirds of its people are in farming, and that also is interrupted by periodic flooding. In August, floods displaced about five million people. The gross domestic product (GDP) last year was $71 billion—less than two days of US output. The size of the country’s market is itself a deterrent. With a total value of about $8 billion, every share of every company could be bought eight times over by Microsoft Corp. founder Bill Gates, the richest man in the US. Vijay Tohani, who helps manage funds with assets valued at $22 billion, or more than twice Bangladesh’s entire stock market, said it is size, not politics, that’s keeping him away. “It’s still very much in its infancy," said Tohani, a senior portfolio manager at Singapore-based First State Investments Ltd. “I did visit some companies, and my initial fact-finding was positive. Interesting opportunities will unfold, but it’s still in the early days." Bangladesh’s turnaround began a year ago, when President Iajuddin Ahmed cancelled national elections following months of clashes between supporters of rival political parties. He installed Fakhruddin Ahmed, former governor of Bangladesh Bank, as chief adviser of the interim government in January. The administration arrested former prime ministers Khaleda Zia and Sheikh Hasina Wajed, in a crackdown on corruption. The economy will grow as much as 7% in 2007—its fastest pace in about 30 years, because “the transitional government has moved forward with a number of previously stalled economic reforms," the International Monetary Fund had said in July. The stock market will almost double in size to more than $15 billion in 2008, led by share sales of state enterprises, said Salahuddin Ahmed Khan, chief executive officer of the Dhaka Stock Exchange Ltd.
GrameenPhone, which connects villages through mobile phones, plans to sell shares next year, chief executive officer Erik Aas said. Yunus and Grameen Bank, which he founded in the 1970s, won last year’s Nobel Peace Prize for giving loans to Bangladesh’s rural poor without asking for collateral. Dhaka’s exchange, founded in 1954, currently has 261 listed companies. Foreigners face no limits on investments. While the Dhaka index remains about 27% below its record close of 3,648.75 set on 5 November 1996, the rally has made stocks more expensive than other emerging markets, driven by increasing inflows from Bangladeshis working overseas. “Returns have been fantastic," Aas said. “Local people are bullish and foreigners are looking at the market more seriously." Jay Shankar in Bangalore contributed to this story.